Did you her the NEWS? Pop over to the CASology blog to see the exciting news that we have to share with you today! So cute! The little birdie looks pregnant. This is such a delightful card Tracey! Love how you have partly coloured that bird's gorgeous swelling belly! So very sweet! This is so simple and adorable. Love you you partially colored that sweet bird. How tweet is this!? The fact that your bird has some funky colors and sparkle going on makes me happy! Such a darling card. Love that birdie! Truly a bundle of joy here, Tracey... don't we wish we could cuddle that new little bundle? And such a great name!!! So cute! This is such a sweet bird and I love how you colored him in, Tracey! Love the touch of sparkle with your WOS marker, too! love how you added just a hint of color.. great card. Very sweet! I love the shading and the sparkle! Love the simple coloring/shading. Great card! Sooooooo fun! LOVING that sentiment!!!!!! 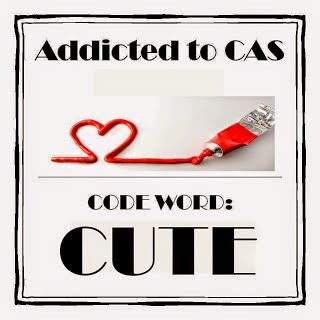 So CAS and oh so cute! 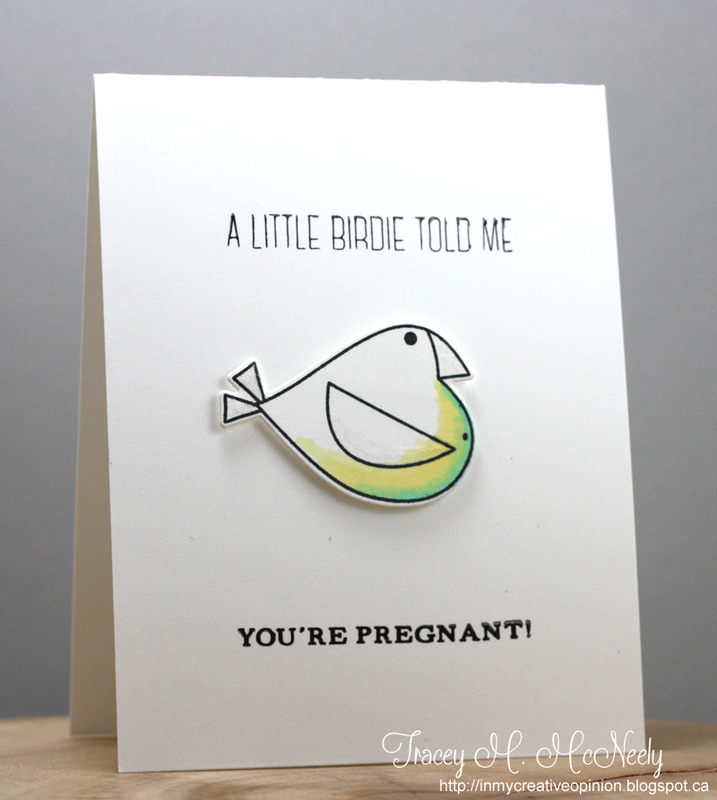 What a sweet stamp Tracey - that little birdie looks like she's about to pop any day! Love how you've highlighted her belly with the Wink of Stella! I like that you colored just the tummy, this is adorable! 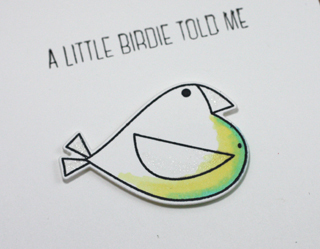 super cute and fun, love how you colored the bird! Ultra CAS Tracey!! Lovely coloring.... She really looks due!!! Oh gosh , how cute is that!! Love it Tracey!! Oh Tracey, what a perfect little image for this sentiment! I didn't realise until I read the sentiment that the cute bird does indeed look pregnant! Love it! Love the bird with lovely color and glitter...too CUTE! This is adorable! I love the bit of sparkle from the Wink of Stella! Tracey....this is just too darn cute! I love your sweet mama bird. Darling card, Tracey. It reminds me of the selfie my granddaughter took today of her baby bump. Too cute! What a darling, little bird! So very sweet--love the wee bit of color! So cute...I love the little belly button! Simply adorable! Beautiful shading, so subtle...the Wink of Stella is divine! Love you CAS design!! This is oh soo cute! Love that birdie! Hey Tracey!! I love your bird. So pretty! I love the colors you choose to use. Nicely done! !